Sharyn Altman gardens on a large tract that backs up to a pond. Flowers flourish in the sunny areas and under the trees along the woodland path. She and her husband enjoy nature and the wildlife that trees and water bring to their property; except when it comes to their fruit and vegetable patch. 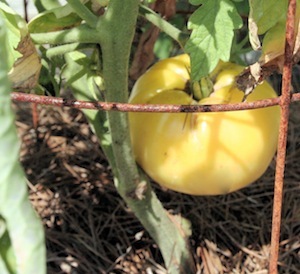 Although there are plenty of wildlife repellents on the market, plain old ingenuity in the garden can keep vegetables and fruit safe from marauding squirrels and raccoons. 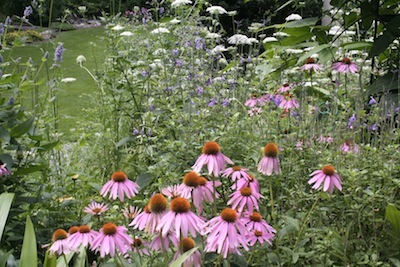 The Altmans have devised several barriers, keeping birds and beasts at bay, so the people planters and growers can enjoy the fruits and vegetables of their labors. The Altman’s vegetable and fruit patches are down a path near the side of a large pond. All are enclosed in a low bunny-proof fenced area but the enclosure does not stop there. Tomatoes and cucumbers grow up inside tall cages open to the sun. Squash climbs large panels of open fencing made from concrete reinforcement wire. The wood sides of the raised planting bed secure the teepee. The slant of the sides makes squash climbing and harvesting easier. Not far away, blueberries are overloading the branches inside a mesh cage made of nylon bird netting. This, to keep the birds out, not in! The wood fence and metal hoops support the netting on the bed. 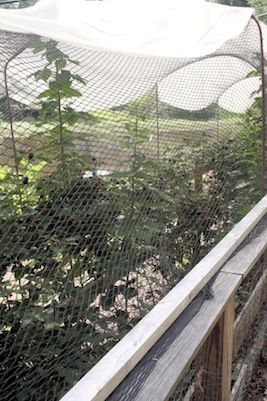 Blackberries are ripening in the same type of cage with a shade cloth over the top to cut the intensity of the noonday sun. 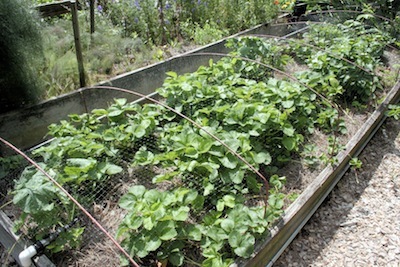 Netting also protects the strawberry patch. 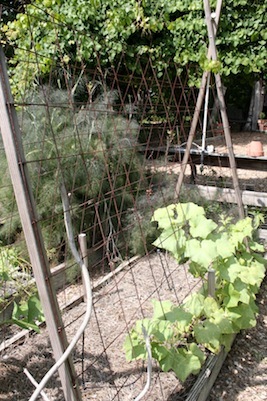 Short hoops hold the netting above the berry patch in their raised bed. February doesn’t have to be a Blah month. Spice it up with a garden project before the spring chores set in. Snow several feet deep in your garden? Build them indoors and move them out during the spring thaw. Have a garden Valentine? One or more of these garden structures, including the raised beds, would make a budding or expert gardener very happy.